The hookah pipe is called the nargile in Turkey. It’s a surprisingly popular activity among Istanbullus of all ages, and we partook in quite a few smoking sessions ourselves. You can order from a variety of different flavors, and spend hours lounging around, smoking and drinking tea. 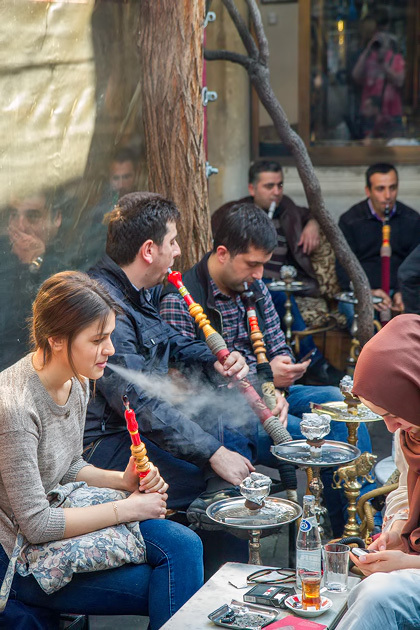 The nargile has long been a prominent part of Turkish culture, although the introduction of cigarettes led to a serious decline in its stature. Lately, though, it’s been making a comeback among young people. It’s completely different to smoking a cigarette. You take your time with a nargile, and usually smoke with a group of friends. It’s social, and a lot more tranquil than hurriedly puffing down a cigarette as you rush off down the sidewalk. Besides which, it tastes great. Apple is the mainstay, but you can try cherry, banana, coffee, orange or melon flavored, in addition to many others. Our personal favorite was a mix of a apple and mint, and we had a few favorite places to smoke. The Perla Kallavi rooftop cafe off Istiklal Caddesi… the crazy collection of nargile bars at Tophane… Erenler Nargile near the Grand Bazaar … the Ağa Kapısı near Süleymaniye, with a great view over the Golden Horn… the courtyard of the Re Cafe in Kadiköy. In just about any corner of the city, we could find a good spot (and invent a good excuse) to sit down for a couple hours with a pipe.